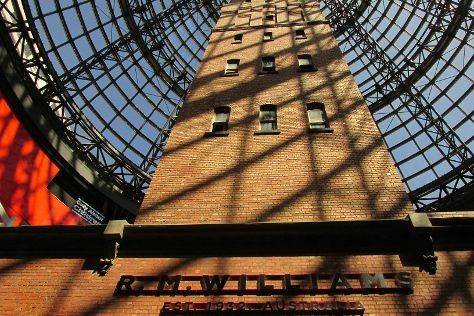 Do some cultural sightseeing at Melbourne Central and St Mark's Anglican Church. Eschew the tourist crowds and head to St Paul's Cathedral and Hanging Rock Reserve. Get out of town with these interesting Melbourne side-trips: Jodee Creations (in Mount Evelyn), Bruno's Art and Sculpture Garden (in Marysville) and Yarra Valley Chocolaterie & Ice Creamery (in Yarra Glen). Spend the 23rd (Thu) on a tasty journey with a beer tour and tasting. The adventure continues: wander the streets of Collins St/Swanston St, brush up on your knowledge of spirits at Four Pillars Distillery, identify plant and animal life at Y Water Discovery Centre, and learn about winemaking at Sedona Estate. For where to stay, maps, reviews, and tourist information, use the Melbourne trip planner . Singapore, Singapore to Melbourne is an approximately 10.5-hour flight. You can also do a combination of flight and shuttle. You'll lose 2 hours traveling from Singapore to Melbourne due to the time zone difference. Prepare for colder weather when traveling from Singapore in May: high temperatures in Melbourne hover around 20°C and lows are around 9°C. Cap off your sightseeing on the 23rd (Thu) early enough to go by car to Werribee. Werribee is a suburb of Melbourne, Victoria, Australia, 32 km south-west of Melbourne's Central Business District, located within the City of Wyndham local government area. Kick off your visit on the 24th (Fri): make a trip to Werribee South Beach, then contemplate the long history of Truganina Explosives Reserve, then identify plant and animal life at Heathdale Glen Orden Wetlands, and finally pick up some local products at Eynesbury Market. To find other places to visit, maps, ratings, and other tourist information, read our Werribee trip planner. Werribee is very close to Melbourne. Expect a daytime high around 20°C in May, and nighttime lows around 9°C. Finish your sightseeing early on the 24th (Fri) to allow enough time to drive to Torquay. On the 25th (Sat), kick back and relax at 13th Beach and then stroll around Coogoorah Park Nature Reserve. To find photos, more things to do, ratings, and tourist information, you can read our Torquay day trip website . Getting from Werribee to Torquay by car takes about an hour. Other options: take a train; or do a combination of train and bus. In May in Torquay, expect temperatures between 20°C during the day and 8°C at night. Wrap up your sightseeing on the 25th (Sat) to allow time to drive to Port Campbell. Port Campbell is a coastal town in Victoria, Australia. On the 26th (Sun), do a tasting at Newtons Ridge Estate Vineyard & Winery, look for gifts at Hugs Across The Cosmos, then make a trip to The Grotto, and finally contemplate the waterfront views at Bay of Martyrs. Here are some ideas for day two: kick back and relax at Port Campbell precinct and foreshore, take in the dramatic natural features at The Razorback, and then explore and take pictures at Gibsons Steps. To find other places to visit, ratings, traveler tips, and more tourist information, refer to the Port Campbell attractions planner. You can drive from Torquay to Port Campbell in 2.5 hours. Alternatively, you can do a combination of train and bus; or take a bus. Wrap up your sightseeing on the 27th (Mon) early enough to take a bus to Warrnambool. Warrnambool is a regional centre and former port city on the south-western coast of Victoria, Australia. On the 28th (Tue), grab your bike and head to Foreshore Promenade, then identify plant and animal life at Thunder point Coastal Reserve, then admire the landmark architecture of Griffiths Island Lighthouse, and finally browse the fresh offerings at PORT FAIRY FARMERS MARKET. Get ready for a full day of sightseeing on the next day: identify plant and animal life at Childer's Cove, kick back and relax at Logan's Beach, and then don't miss a visit to Warrnambool Breakwater. You can plan Warrnambool trip in no time by asking Inspirock to help create your itinerary. You can take a bus from Port Campbell to Warrnambool in an hour. Alternatively, you can drive. Wrap up your sightseeing on the 29th (Wed) early enough to drive to Ballarat. Start off your visit on the 30th (Thu): tour the pleasant surroundings at Hepburn Lagoon - Trail Rides, then view the masterpieces at Stony Creek Gallery, then take in nature's colorful creations at Hepburn Mineral Springs Reserve, and finally do a tasting at Passing Clouds Winery. Get ready for a full day of sightseeing on the 31st (Fri): stop by Portal 108, then sample the fine beverages at Daylesford Cider Company, then do a tasting at Captains Creek Organic Wines, and finally admire the striking features of Ballarat Railway Station. For photos, reviews, more things to do, and more tourist information, you can read our Ballarat vacation maker tool . Drive from Warrnambool to Ballarat in 2.5 hours. Alternatively, you can take a bus; or take a train. In May, daily temperatures in Ballarat can reach 20°C, while at night they dip to 8°C. Finish up your sightseeing early on the 31st (Fri) so you can go by car to St Kilda. St Kilda is an inner suburb (neighbourhood) of the metropolitan area of Melbourne, Victoria, Australia, 6 km south-east of Melbourne's Central Business District. Kick off your visit on the 1st (Sat): take in the architecture and atmosphere at Williamstown Uniting Church, indulge in some personalized pampering at some of the best spas, and then identify plant and animal life at Seaford Foreshore Reserve. Here are some ideas for day two: pause for some serene contemplation at St John's Anglican Church and then take in nature's colorful creations at Old Cheese Factory. For maps, reviews, other places to visit, and more tourist information, read our St Kilda trip planner . Getting from Ballarat to St Kilda by car takes about 1.5 hours. Other options: take a train; or take a bus. Expect a daytime high around 20°C in May, and nighttime lows around 10°C. On the 2nd (Sun), wrap the sightseeing up by early afternoon so you can travel back home.